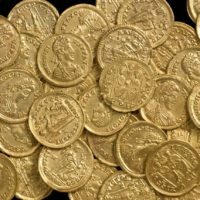 The UK Govt has opened a public consultation on on the 1996 Treasure Act which could change how archaeological finds are dealt with in England, Wales, and Northern Ireland (*but not Scotland, we’re different up here). See the website here, and the consultation document here. For an article in the Guardian about the consultation, see Golden rule: plan to redefine ‘treasure’ to help UK museums buy finds by Esther Addley. With this consultation, DCMS are opening the possibility of defining treasure beyond a) amount of gold and silver/prehistoric base metals and b) deliberateness of hiding. These and other features of the Treasure Act are vestigial bits of the Act’s origins in Medieval Treasure Trove law; the unfortunate result of slowly repurposing something meant to allow the monarch to line their pockets with abandoned money into the country’s archaeological policy. Toss it out entirely and write dedicated policy for preservation of archaeological heritage you say? Well don’t tell me, respond to the public consultation. -and the introduction of a regulation as in Northern Ireland where archaeological digging of any sort (both by professional archaeologists and others) is only allowed by permit. Ooo! Can we have all those things? They sound great! In total, there are 32 questions for you, the interested and expert public, to comment on this this document. You have until 30 April 2019 to say your piece and the comment form can be found here. The Act is certainly controversial, and everyone on all sides of the discussion certainly moans about it. This is our chance to put that moaning into well-reasoned words to possibly effect change. Don’t hesitate: if you are reading this, you are an interested party. Have your say.